(Phys.org) —Frogs that rely on their vivid colour markings to ward off predators can also appear invisible, Deakin University scientists have discovered. Researchers from Deakin University's Centre for Integrated Ecology found the anomaly among a species of frog in which some individuals use their rainbow hues to warn they are poisonous or toxic while others rely on their colourings to make them difficult to detect. Centre for Integrated Ecology evolutionary biologist Professor John Endler and his Ph.D. student and co-author studied poison dart frogs in the wild and identified the reason behind the paradoxical observation that the amphibian's colourful markings varied between each animal. 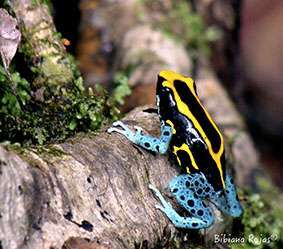 Studying the vibrant blue and yellow poison dart frogs (Dendrobates tinctorius) in their natural habitat in French Guiana, Deakin researcher Bibiana Rojas found that one group of frogs exhibited bold or elongated patterns, the other demonstrated mottled and more variable markings. The paradox was that the more variable the frog's markings, the less likely were predators to learn to recognise the danger. But if different colour patterns accompanied different behaviour, then pattern variation can be an advantage instead of a disadvantage. "We found that some frogs move frequently in the same direction while others moved randomly, and that this movement behaviour variation corresponded to the colour patterns," Professor Endler said. "The frogs with elongated patterns moved continuously in the same direction to create an illusion of static pattern, or a pattern travelling at a slower speed, to thwart predators attempting to track their trajectory. "But frogs which moved randomly and changed directions frequently, rely on interrupted colour patterns that appear visually disruptive and hard to see at a distance, giving them an advantage in predator detection rather than tracking. "These findings are quite exciting as we believe they might have application in the human world for defence camouflage," Professor Endler said. "Alternatively, taxis, police cars, and ambulances could be painted with horizontal stripes to make them more easily seen when they are going past." Professor Endler has been studying aposematic animals for many years - species that use colour in the wild to either attract a mate or ward off predation. In Australia, Blue-ringed octopus and redback spiders, and the introduced Monarch Butterfly are among a variety of animal species instantly recognised for their chromatic colours that warn of their danger to would-be predators. Black, red, yellow and white are among the bold colour schemes employed in nature to warn of danger. The researcher's report, "Paradox lost: variable colour-pattern geometry is associated with differences in movement of aposematic frogs", has been published in the latest copy of the prestigious Royal Society Journal Biology Letters.